Are Interest Rates Going Up in December? Subject: Are Interest Rates Going Up in December? × one = 3 Required Please enter the correct value. As we head into the final stretch of 2016, with stocks and the economy showing signs of improvement, investors are now wondering if interest rates are going up in December. Market odds of an interest rate hike following the December FOMC meeting on Dec. 13-14 sit at 98.2%, according to CME Group's Fed Watch tool. The likelihood of an interest rate hike in December has spiked since Donald Trump won the presidential election. Stocks are surging as traders believe President-elect Trump will spur economic growth. The Dow, S&P 500, Nasdaq, and Russell 2000 all closed at record highs last week. Trump's plans to cut taxes, reduce bank regulations, and spend heavily on infrastructure have all sent markets higher. A recent string of data reflects an improving U.S. economy. Manufacturing activity has picked up, durable sales figures are climbing, retail sales are rising, home sales are robust, and America is at or near full employment. But a rate hike is not a guarantee. There are still multiple data reports expected before the next FOMC meeting. That includes Friday morning's employment report. Economists are looking for employers to have increased headcount by 180,000 in November, with the unemployment rate holding steady at 4.9%. Another jobs report showing steady and solid job growth could be all the Fed needs to feel comfortable enough to raise interest rates. Without question, policymakers have been preparing investors for an interest rate hike in December. 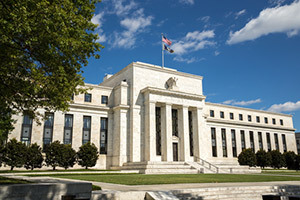 Minutes from the November Fed meeting reveal that most central bank members believe it would be appropriate to raise rates "relatively soon provided economic data remains encouraging." Also, some FOMC members said keeping rates too low for too much longer could move investors to search for yield elsewhere. That could lead to investors mispricing assets like bonds and putting capital where it shouldn't be. The Fed last lifted rates in December 2015, raising its key interest rate from a range of 0% to 0.25% to a range of 0.25% to 0.5%. It was the first interest rate hike in nearly a decade.